When Karen Keenan was asked what the best part of the class is... Her response was: all of it, Tamara we really like your teaching style. Keep up the great work! Thank you for everything. See you next session. Thank you so much for the photo. Since our classes we have been continuing to make progress with Casey - especially with not pulling on the leash. We are enjoying her so much more now that she is more disciplined. (Chris and I are more disciplined too!). Your lessons have been really helpful. We are also looking forward to introducing Casey to the canoe next summer. Thanks again. We all loved working with you. Your training methods are so positive and the dogs felt such good energy from you that they wanted to work for you. Right away, we understood that they could learn and that they wanted to learn. After that, the training was more about the owners than it was the dogs. We had to put the effort into teaching them. We feel much more confident about the dog's safety now that they respond to some basic commands, and that was paramount in our wanting to do this training. We felt that you undercharged for what we received, including the e-mail reviews which were written long after this household had packed it in for the night. Thank you, again, for your help. Just a note so you will know Buddy and Bear are doing better, many thanks for your help! Just read your news letter , I think its a great idea lots of good information. Metro Dog Wash hosted Tamara McFarland from "Unleashed Pawsabilities" out in Tantallon to give a talk about ideas for how to clip your dog's nails or make it easier to give your dog a bath - or just deal with dogs that don't like to be touched in general. It was the first time I met her, even though we've exchanged quite a few emails in the past - and she had lots of super tips to give. Her 10 year old dog Sierra was a perfect test dog and acted like he'd never tasted the treats she was giving him before in his life! haha! The topic she presented was such a good idea too - I hope that Terri has Tamara back again to give the seminar again because the tips that she gave were really helpful - and I think tons of people would be helped by them. 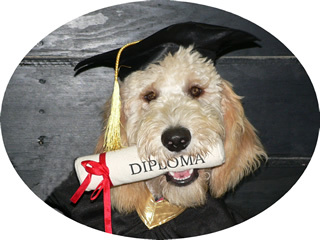 Tamara has an obedience school in Tantallon - I'm sure the people out there are thankful to have her, because she teaches really positive methods and I really liked her very happy attitude. I'd bet the dogs she trains turn out very well adjusted and highly social. And happy too! Just like Sierra! I like the handouts. They offer good support for other family members who can't always attend. The demonstrations are very helpful and useful, as are the handouts - very interesting. I think the classes are very useful, I am recommending this class to GPAC [Greyhound Pets of Atlantic Canada] for new greyhound owners. We have 2 pups/same litter. I shudder to think where we would be without the classes. Thank you for your patience and help!